Outlining Rutherford County are the rural communities set upon a beautiful landscape and steeped in colonial and gold rush history. Availability for agricultural development is what originally drew early pioneers of Scot-Irish and English ancestry decades before the Revolutionary War. These hardy folks followed the Great Wagon Road from Pennsylvania and neighboring Virginia, spreading throughout the region on the east side of the great and mysterious Blue Ridge Mountains. Many of these settlers began to arrive here in the mid-1700's and began their first settlement communities. 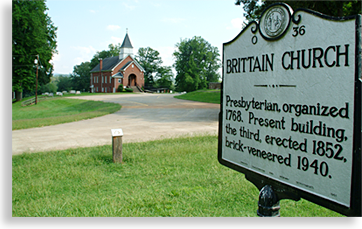 Westminster, the oldest and still existing community located in the center of today's Rutherford County was established Brittain Church 1768, prior to 1768. The newly arrived Presbyterians organized and built the original Brittain Church in Westminster in 1768. Still performing as a church today, the Brittain Church with its present church building being the third construction since it's founding, is one of the corner stone's of history in Rutherford County. The present church standing today was constructed in 1852 and was brick-veneered in 1940. Gilbert Town, the original county seat was once an early neighboring community of Westminster, dating back to the pre-Revolutionary War period. Gilbert Town is no longer a town and has no official markings on the local maps; a historical marker does mark the former site just a few miles north of the present county seat of Rutherfordton. Some of the other communities with deep roots here in the northern foothills of Rutherford County are Logan, Gilkey, Union Mills, and Thermal City. Throughout the northeastern part of the county with its fields, meadows and foothills are the towns and communities of Ellenboro, Caroleen, Harris, Henrietta, Cliffside, Sunshine, Washburn, Washburn House Hollis and Bostic. Listed on the National Registry of Historic Places in 2002 is the "Washburn Village," which includes the Washburn House built in 1913, the barn and the 1831 Washburn (Country) Store which is still owned and operated by the family today, continuing a legacy that has lasted nearly two centuries, a true testament of time. The Washburn Country store is believed to be the oldest business in the state of North Carolina. In the serene southern reaches of the county is the beautifully preserved historic Green River Plantation house built from 1804 to 1807. A time when cotton was king, land was plentiful and labor was something to start a Civil War over. The townships of Rutherford County are; Golden Valley, Logan Store, Duncans Creek, Colfax, High Shoals, Cool Spring, Sulphur Springs, Green Hill, Gilkey, Camp Creek, Morgan and Chimney Rock.